It gave the charge as it approved a fresh external loan of $2.868 billion, requested by President Muhammadu Buhari. The loan consists mainly of the issuance of $2.786 billion from the international capital market. Another segment of the loan is the issuance of USD82.54 million to refinance the balance of $500 million matured Eurobond in the international capital market. The upper chamber took the resolutions while considering a report on the request by Buhari for ‘External Capital Raising of USD2.786 Billion from the International Capital Market Approved in the 2018 Appropriation Act; and the External Capital Raising of USD82.54 Million to refinance the balance of USD500 million matured Eurobond in the International Capital Market’. Presenting the report, the chairman of the Senate Committee on Local and Foreign Debts, Senator Shehu Sani, said the committee observed that the “proposed External Capital raising of USD82.54 million was to refinance the balance of USD500 million Eurobond in the International Capital Market, which matured on July 12, 2018 with an interest rate of 5.125 per cent. Sani said the committee also observed that the capital raising of USD2.786 billion would result in a portfolio mix of domestic debt, 68 per cent and external debt, 32 per cent, which is an improvement over the ratio of 70:30 as at June 30, 2018. “This brings the debts portfolio mix closer to the target of 60:40,” he said. Simultaneously, the Federal Executive Council (FEC) also approved six transaction party advisers for the issuance of the Eurobond and other securities in the international capital market. The Minister of Finance, Zainab Ahmed, made the disclosure after the council meeting presided over by President Muhammadu Buhari at the State House, Abuja. She explained that the money would help finance the external borrowing plans of $2.76 billion to fund the 2018 capital budget. She said FEC also approved a request to raise $82.54 million to bridge the shortfall in the $500 million Eurobond that matured in July 2018. “We also got approval for transaction parties for their fees and expenses. There are five parties in the transactions, two joint lead managers, with a combination of three banks. The banks include Standard Chartered Bank, FSDH Merchant Bank, White and Case LLP, who are acting as legal advisers (foreign) and Banwo and Ighodalo (local). Also at the Senate, a resolution was passed yesterday to probe alleged illicit and excessive charges by commercial banks. The chamber also mandated relevant committees to summon Central Bank Governor Godwin Emefiele for questioning. Emefiele would be expected to explain why charges approved by the CBN are skewed in favour of the banks as against customers. The chamber further urged the CBN to suspend ATM Card maintenance charges deducted from customers’ accounts pending the outcome of its investigation. The Senate session was however not without drama. 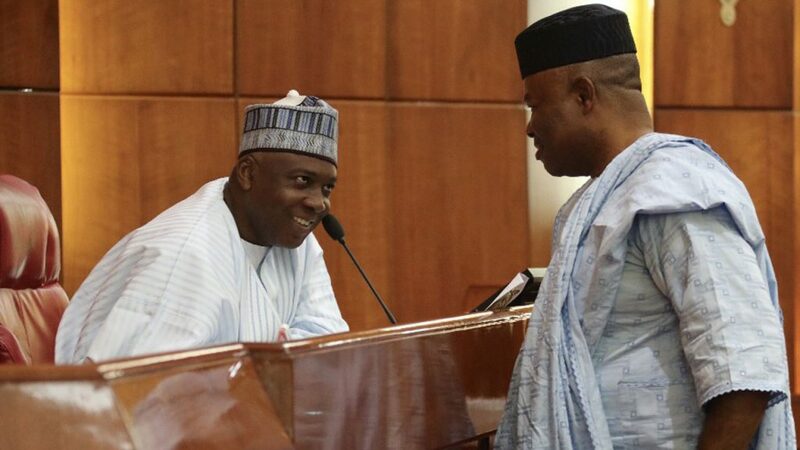 An argument ensued when the Senate President Bukola Saraki refused to allow former Minority Leader Godswill Akpabio to contribute to a point of order raised by Senator Bassey Akpan. Akpan had accused the All Progressives Congress (APC) in Akwa Ibom State of plotting to cause chaos in the 2019 general election. Saraki refused to acknowledge Akpabio’s contribution, saying he would not be allowed to speak unless from his seat. “Former minority leader, you know you cannot speak from there. Go to your seat. When you get to your seat, I will recognise you,” he said. The Senate Leader Ahmad Lawan was however not comfortable with Saraki’s position, as he stood to defend Akpabio. “As it stands today, in this chamber, there is no organised sitting arrangement. If he decides to sit there, let him. There is no microphone there. Let us not take the Panadol for his headache. Let me advise that even though we have only six, seven months to go, let’s do what is right,” said Lawan. In the course of his comment, the lawmakers began to talk at random, throwing the chamber into a rowdy session. They refused to calm down in spite of Deputy Senate President Ike Ekweremadu’s intervention.The situation however became relatively quiet when Akpabio stood up to explain that the clerk of the Senate had allocated the seat to him.